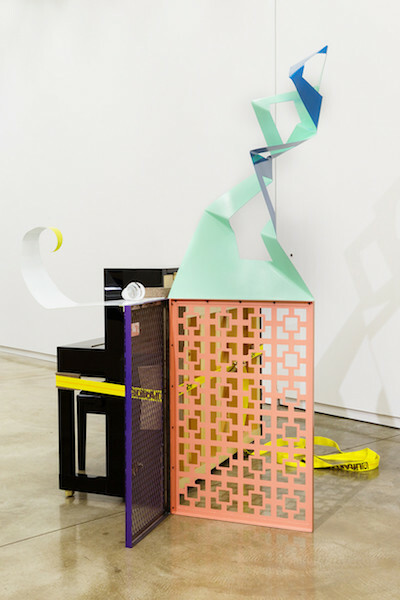 Jessica Stockholder: Door Hinges, 2018. Stockholder has invited the renowned First Nations sculptor, painter, and printmaker Robert Davidson (Haida, born 1946 in Hydaburg, Prince of Wales-Outer Ketchikan division, Alaska) to exhibit a selection of works within the Jones Center installation. Davidson’s Haida name is Guud San Glans, which means Eagle of the Dawn. He currently lives and works in White Rock near Vancouver and Massett in Haida Gwaii.